Create a cozy conversation area for your next gathering with the Lakeview Outdoor Designs 42-Inch Stainless Steel Square Fire Pit. 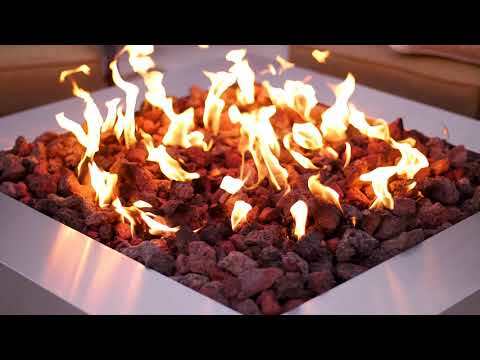 This sleek fire pit comes complete with a 24-inch stainless steel double fire pit ring that produces a maximum of 296,000 BTUs and 48 pounds of free lava rocks. For a more contemporary look, you can replace the included lava rock with fire glass. Key valve accepts 1/2 inch male fitting hose. Stainless steel surround measures 42 W x 42 L x 16. 25 H. This stainless steel fire pit opening is 30 W x 30 D x 2 H. This 304 commercial grade stainless steel fire pit has adjustable feet for ease in leveling. Lakeview combines bold styling with high performance, making this Stainless Steel fire pit a great addition to your outdoor space. The 24-Inch double ring burner produces 400,000 BTUs which creates an impressive flame pattern and puts out a good amount of heat on those cool nights around the fire. Available in octagon and square shapes, it is easy to install and comes with 48 pounds (lbs) of lava rocks to finish off the look of the fire pit. Features include easy to use key valve and adjustable feet for leveling. Enjoy this fire pit for years to come since it is built to last with heavy duty 304 Stainless Steel and has fully welded corners that are ground smooth for added durability. All Stainless Steel parts come with a limited lifetime warranty. Includes 48 pounds (lbs) of lava rocks for a traditional meets modern look; however, you can create a more contemporary look by switching out the lava rock for fire glass. For the propane version of this product, does the propane tank get stored below the table or remotely? Hi Tom, the fire pit does not have a means of concealing the propane tank. The tank will have to sit off the side of the fire pit.